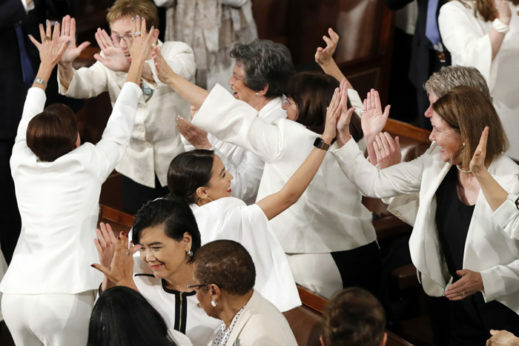 WASHINGTON—To borrow Michelle Obama’s famous quote, Donald Trump “goes low” in his State of the Union address, and Stacey Abrams’s “goes high” in her Democratic response. That, in essence, is the contrast between Trump’s 92-minute speech from the U.S. House rostrum and Abrams’s shorter, positive, reply from an Electrical Workers union hall in Atlanta. Trump filled his speech with red meat for the radical right, denunciations of “socialism,” and a renewed campaign for his racist Mexican Wall. His speech featured omissions, outright lies – such as claiming credit for the U.S. recovery from the GOP-policy-caused Great Recession — and gratuitous insults. 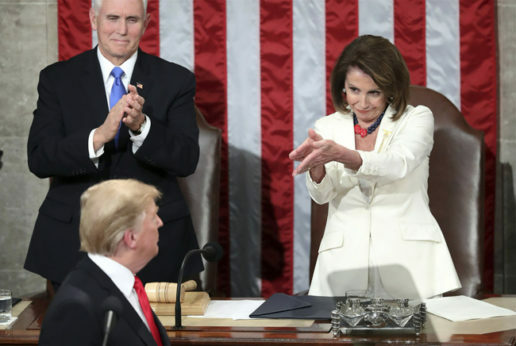 House Speaker Nancy Pelosi, D-Calif., struggled to keep from rolling her eyes. And Trump threw in occasional calls for bipartisanship, without specifying where he would negotiate – or on what. He also used veterans of World War II as props. June 6 is the 75th anniversary of D-Day. Abrams, the first African-American woman ever nominated for a state governorship, now leads a pro-voting rights organization. After voting roll purges of blacks by the white male GOP Secretary of State. Abrams was narrowly defeated last fall. Her talk highlighted congressional Democratic efforts to restore U.S. democracy, eliminating the corrupt influence of the corporate class’s big money in politics and restoring the full right to vote with laws that have strong enforcement teeth. 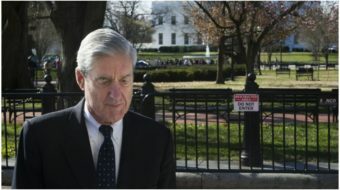 The “power grab” line came actually not from Trump, but from his chief spear carrier, Senate Majority Leader Mitch McConnell, R-Kent., several days before. “We fought Jim Crow with the Civil Rights Act and the Voting Rights Act, yet we continue to confront racism from our past and in our present — which is why we must hold everyone from the very highest offices to our own families accountable for racist words and deeds, and call racism what it is. Wrong,” Abrams said. The House Democrats agree. They already started moving on their voting rights/civil rights package, HR1, with a Judiciary Committee hearing on it the day before Trump’s address. In addition to restoring the teeth the Supreme Court’s GOP-named majority pulled from the Voting Rights Act, HR1 would outlaw voter intimidation, promote easy voter registration, force disclosure of shady campaign contributions, and mandate states set up independent redistricting commissions. That would end congressional gerrymanders which GOP-run state legislatures use to deny voting rights and political power to blacks, browns, women, students, Native Americans — and to workers. Voting rights wasn’t the only area where Democrats, and workers, took on Trump. Worker rights, especially for the 800,000 federal employees Trump refused to pay for 35 days, also loomed large. Trump forced almost half of them – including the airport screeners, air traffic controllers, and federal firefighters – to work without pay. The other half he locked out. One depressed screener, unable to pay his bills or feed his family, committed suicide in Orlando Airport on Feb. 2. Trump didn’t mention that. By contrast, Abrams volunteered at a soup kitchen to feed the locked-out workers and blasted Trump’s lockout/shutdown. And while Trump didn’t mention tough gun control, Abrams did. Democratic-run House committees held a Feb. 6 hearing on that, too. “Our most urgent work is to realize Americans’ dreams of today and tomorrow. To carve a path to independence and prosperity that can last a lifetime. Children deserve an excellent education from cradle to career. 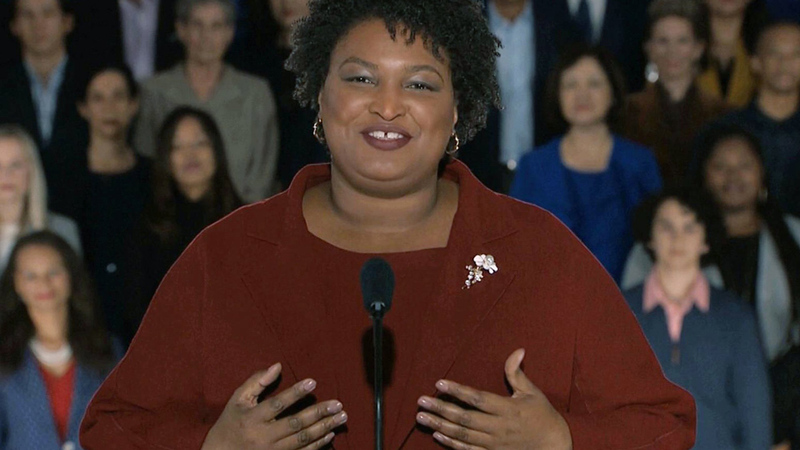 We owe them safe schools and the highest standards, regardless of zip code,” Abrams said. And while Trump claimed credit for an economic expansion he wasn’t responsible for, he didn’t even utter the word “workers,” who were the ones who lost houses, jobs, and pensions to the GOP-corporate-and-financier-engineered Great Recession, otherwise known as the Bush Crash. Abrams pointed out workers are still hurting, and she specifically declared unions are one big way they can recover lost ground. “In Georgia and around the country, people are striving for a middle class where a salary truly equals economic security. But instead, families’ hopes are being crushed by Republican leadership that ignores real life or just doesn’t understand it. Under the current administration, far too many hard-working Americans are falling behind, living paycheck to paycheck, most without labor unions to protect them from even worse harm,” she said. “The Republican tax bill rigged the system against working people. Rather than bringing back jobs, plants are closing, layoffs are looming and wages struggle to keep pace with the actual cost of living,” Abrams added. Meanwhile, Rep. Andy Levin, D-Mich., a former AFL-CIO staffer, added that Trump’s policies, including his $1.5 trillion tax cut for the rich and companies, only extend the pain for workers – especially when firms like GM pocket the cash and still move plants and jobs to Mexico, China and other low-wage exploitative nations. Levin made that point another way. Lawmakers can invite guests to the State of the Union addresses, and many Democrats used their invitations to do so. Pelosi’s guests included an undocumented mother and her daughter, a DACA recipient – and five union presidents, led by AFGE’s J. David Cox. His union includes tens of thousands of Trump shutdown victims. Levin’s guest was Ghana Goodwin-Dye, president of UAW Local 909 in Warren, Mich. Her members at GM’s Warren Transmissions Plant are losing their jobs: GM is shutting it, as well as plants in Ohio, Maryland and elsewhere in Michigan. It’s moving the Warren jobs to Mexico. “That’s the real American economy,” Levin said of the GM job losses. Other Democrats invited formerly locked-out federal workers, Planned Parenthood beneficiaries and the reproductive rights organization’s new president. Those Planned Parenthood invitations were a direct slam at Trump’s outright lie about New York and Virginia legislation allowing doctors to kill newborns. Trump also used his speech to campaign, again, for his racist $5.7 billion Mexican Wall. He’s threatened to shut part of the federal government again on Feb. 15 unless Congress caves in to his demand. “Compassionate treatment at the border is not the same as open borders,” Abrams retorted, invoking presidents of both parties. And while Democrats want to “effectively secure our ports and borders,” she replied that “America is made stronger by the presence of immigrants – not walls. To put an exclamation point on opposition to Trump’s Wall, California Attorney General Xavier Becerra, in the Dems’ response for Spanish speakers, said if Trump invokes a “national emergency” to grab wall money from the Defense Department, California will head to court to stop it. Trump denounced what he called “socialism” in Venezuela and the U.S., but omitted any plans he has to send troops to intervene in the Latin American nation – interventions the U.S. has wielded up and down Central and South American for more than a century. 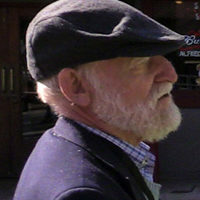 One of main targets there – unspoken – was Sen. Bernie Sanders, Ind-Vt., and his key cause in the 2016 campaign, universal government-run Medicare For All. Abrams defended the Affordable Care Act. Sanders had choice words about “socialism” and freedom, including freedom from health care worries.